Bay, born in USA in 1998. Ganador a los 3 años en Irlanda. FREUD (USA), es por storm cat (USA-1983): Ganador de 4 carreras en USA. , incl. Young America Stakes (USA-1), 2da. Breeders’ Cup Juvenile Stakes (USA-1), World Appeal Stakes (USA). Es padre hasta el momento de mas 100 ganadores clásícos, inc. de: GIANT’S CASEWAY (“Campeón 3 Años” en Inglaterra e Irlanda, incl. Esat Digiphone Irish Champions Stakes (IRE-1), Judmonte International Stakes (ENG-1), Prix de la Salamandre (FR-1), etc. ); BLACK MINNALOUSHE (“Campeón 3 Años”, en Irlanda, incl. Entenmanns Irish Two Thowsand Guineas (IRE-1), St. James Palace Stakes (ENG-1), Aga Khan Studs Blenheim Stakes (ENG); etc. ); MISTLE CAT (“Caballo Campeón”, en Italia, incl. Premio Vittorio Di Capua (ITY-1), Prix Du Palais Royale (FR-3), etc. ), CATRAIL (“Caballo Campeón”, “Campeón 3 Años”, en Inglaterra, incl. Challenge Stakes (ENG-2), etc. Padrillo. ); NUNAAJI (“Campeón 3 Años” en Alemania, incl. Jacobs Goldene Peitsche (GER-2), etc. 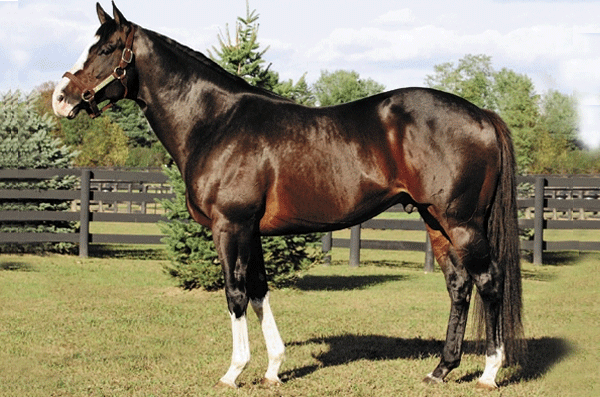 ), SILKEN CAT (“Campeona 2 Años”, en Canadá, incl. Mazerine Stakes (CAN), etc. ); TABASCO CAT (Preakness Stakes (USA-1), Belmont Stakes (USA-1), San Rafael Stakes (USA-2), etc. Padrillo. ), etc.). CAT THIEF ( Breeders’ Cup Classic (USA-1), Swaps Stakes (USA-1), etc. ); SHARP CAT (Acorn Stakes (USA-1), Beldame Stakes (USA-1), etc. ); RAGING FEVER (Frizette Stakes (USA-1), Matron Stakes (USA-1), etc. ); HIGH YIELD (Toyota Blue Grass Stakes (USA-1), Hopeful Stakes (USA-1), etc. 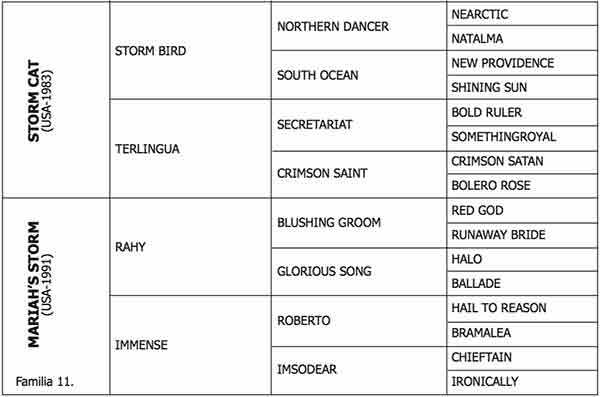 ); STORM FLAG FLYING (Breedres’ Cup Juvenile Fillies (USA-1), etc. ); SARDULA (Kentucky Oaks (USA-1), etc. ); CATINCA (Ruffian Hcap. (USA-1), Shuvee Hcap. (USA-2), etc. ); etc., y los destacados Padrillos en Argentina: EASING ALONG, BERNSTEIN y PURE PRIZE. Freud (USA.- m. Storm Cat), ver campaña en página anterior. GIANT’S CAUSEWAY (USA.- m. Storm Cat), “Campeón 3 Años” en Inglaterra e Irlanda, ganador de 9 carreras en Inglaterra, Irlanda Francia y USA. u$s 3.078.989.- incluso: Breeders’ Cup Classic (USA-1), Juddmonte International Stakes (ENG-1), Coral-Eclipse Stakes (ENG-1) Prix de la Salamandre (FR-1), Champagne Lanson Sussex Stakes (ENG-1), St. James’s Palace STAKES (ENG-1), Esat Digifone Irish Champion Stakes (IRE-1), King of Kings EBF. Futurity Stakes (IRE-3), Gladness Stakes (IRE-3), 2do. Two Thou sand Guineas (ENG-1), Queen Elizabeth II Stakes (ENG-1). Irish Two Thousand Guineas (IRE-1), etc. Padrillo. YOU’RESOTHRILLING (USA.- h. Storm Cat), ganadora de 2 carreras a los 2 años, en Gran Bretaña, incl. Cherry Hinton Stakes (ENG-2), Swordlestown Stud Sprint Stakes (IRE-3), 2da. Albany Stakes (ENG-3), Isabel Morris Stakes (ENG-L). Roar of the Tiger (USA.- m. Storm Cat). ganador en Gran Bretaña, luego gana dor de 3 carreras en USA. 3ro. Gover nor’s Hcap. (USA-L). Tumblebrutus (USA.- m. Storm Cat)., ga nador a los 2 años en Irlanda, 2do. EBF. Futurity S. (IRE-2). Tiger Dance (USA.- m. Storm Cat), gana dor en Gran Bretaña, 3ro. Minstrel Stakes (ENG-3). PANORAMIC (GB.- m. Rainbow Quest), ganador de 3 carreras en Francia, incl. Prix D’harcourt (FR-2), Prix L’avre (FR), 2do. Rothmans Ltd. International Stakes (USA-1), Prix Du Conseil De Paris (FR-2), Prix Foy Escada (FR-3), 3ro. Tattersalls Rogers Gold Cup Stakes (IRE-2). QUEST STAR (USA), ganador de 7 carreras en USA., u$s 876.444.-, Nat’l Museum Racing Hall Of Fame Hcap. (USA-2), Pan American Hcap. (USA-2), 2do.Fourstardave Hcap. (USA-2), Kentucky Cup Turf Hcap. (USA-3), Bow- ling Green Hcap. (USA-2), Pan American Hcap. (USA-2) – 2 veces – Hawthorne Derby (USA-3), OBS. Championship Stakes (USA), 3ro. Woodford Reserve Turf Classic Stakes (USA-1), Jefferson Cup Stakes (USA-3), Kent Breeders’ Cup Stakes (USA-3). MUST GO ON, ganador de 6 carreras en San Isidro, incl. GP Copa de Oro (G1),Clás. Provincia de Buenos Aires (G2), Clás. Chacabuco (G2), 3ro. GP Carlos Pellegrini (G1). KEY DANCE, ganadora de 8 carreras en Palermo, incl. Clás. Carlos Tomkinson (G2), Clás. Ricardo P. Sauze (G3), 2da. Clás. Sibila (G2), Clás. Gral. Las Heras (G3), Clás. Asociacion Propietarios De SPC. (G3). SOMERS TOWN, 2012, ganadora a los 2 años en La Plata del Clás. Amilcar A. Mercader (G3). IL EST FABULEUX, ganador de 3 cs., incl. Clás. Gentlemen, 3ro. Clás. Irlanda (G3). FRANNY FREUD (USA), ganadora de 7 carreras a los 2 y 3 años en USA, incl. Prioress Stakes (USA-1), Beaumont Stakes (USA-2), Ontario Debutante Stakes (USA-L), Fifth Avenue Stakes (USA), New York Stallion Park Avenue Stakes (USA); 2da. Santa Ynez Stakes (USA-2), etc.. GIANT RYAN (USA), múltiple ganador en USA, incl. Vosburgh Stakes (USA-1), Smile Sprint Handicap (USA-2), Ponche Handicap (USA-L), Hamlet Stakes (USA-L). ZEIDE ISAAC (USA), “Campeón Adulto” ganador de 8 carreras en Perú, incl. Clás. Presidente de la República (PER-2), Clás. Ciudad de Lima (PER-2) -2 veces-; 2do. GP Asociación Latinoamericana de Jockey Clubes e Hipódromos (BRZ-1), Almirante Miguel Grau Seminaro (PER-2). FUTURE PROSPECT (USA), ganador en USA., Kentucky Cup Classic Stakes (USA-2), Jazzing Around Stakes (USA), Funny Cide Stakes (USA-L). MR. VEGAS (USA), ganador en USA., incl. Cnel. E. R. Bradley Hcap. (USA-3), etc. BE A GINNY (USA), ganadora en Puerto Rico, incl. Clásico Jinetes (PR-3). QUICK LITTLE MISS (USA), ganadora de 2 carreras a los 2 años en USA, u$s 287.080, incluso Moccasin Stakes (USA-L), 2da. Hollywood Starlet Stakes (USA-1), Santa Ynez Stakes (USA-2), 3ra Oak Leaf Stakes (USA-1). DAGNABIT (USA), ganador de 3 carreras a los 2 años en USA, US$ 242.813, incl. Tremont Stakes (USA-L), Aspirant Stakes (USA), etc. GENERAL MAXIMUS (USA), ganador de 3 carreras en USA, incl. Times Square Stakes (USA). FLIRT FOR FAME (USA), ganadora de 12 carreras de los 2 a los 5 años en USA, u$s 347.350, incl. Isadorable Stakes (USA), Last Dance Stakes (USA), First Episode Stakes (USA) -2 veces-, Mystery Jet Stakes (USA), African Prince Stakes (USA), etc..
LOGIC WAY (USA), ganador de 5 carreras en USA, u$s 328.897, incl. Mohawk Hcap. (USA), etc.